The Russian military says Syria’s Soviet-made air defense systems have shot down all 12 cruise missile aimed at a Syrian air base. The Russian Defense Ministry said that 12 cruise missiles have been launched at the Dumayr air base east of Damascus. It said that Syria’s air defense assets have downed all of them. The Russian military said it hasn’t engaged its air defense assets at its air and naval bases in Syria. In an early-morning reaction on his Twitter and Facebook feeds, Rutte said it was likely that the Syrian regime of President Bashar Assad was behind the suspected chemical attack in Douma. He also criticized Russia for using its veto at the United Nations Security Council to bring more clarity about the attack. “So again, getting the full truth and the use an international legal approach against the use of chemical weapons has been stopped. We greatly regret this,” he said. 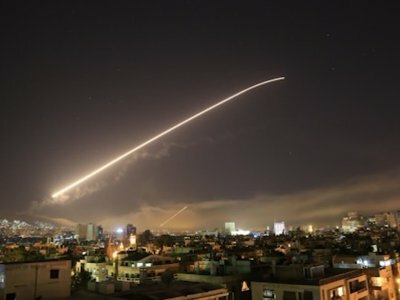 A Syrian military statement says the U.S., Britain and France fired 110 missiles during a joint attack on targets in Damascus and outside. Brig. Gen. Ali Mayhoub, who read the statement on Syrian TV, said “our air defenses effectively shot down most of them.” He says one of the missiles hit the Scientific Research Center in Barzeh near Damascus, damaging a building. In Homs, one of the missiles was derailed injuring three people, he said. Mayhoub says the attacks “will not deter” the Syrian military from its ongoing war to eradicate “armed terrorists” from Syrian territory. The OPCW had said that its experts would be visiting Douma on Saturday. France’s foreign minister says the “chemical escalation” in Syria is not acceptable because it’s violating the rules of war and of humanity. Jean-Yves Le Drian told reporters Saturday that the joint military operation in Syria is legitimate, limited and proportionate. Le Drian says France has two priorities: fighting against the Islamic State group and restoring peace and stability in Syria. He said France is “ready” to work with other countries involved on a peace plan. NATO has issued a strong statement of support for its three allies which launched a military strike against Syria over the suspected chemical attack of last weekend. The United Nations Secretary-General says he is closely watching reports related to the airstrikes on Syria conducted by the U.S., France and Britain. Guterres says: “Any use of chemical weapons is abhorrent. The suffering it causes is horrendous.” He urged U.N. member states to show restraint and avoid any acts that could escalate the situation. A top Russian lawmaker says Moscow’s response to Western airstrikes on Syria must be carefully considered. “Emotion is not what’s needed now, but professional assessment by military specialists working on the scene,” Konstantin Kosachev, head of the foreign affairs committee of the upper house of parliament, said Saturday, according to state news agency RIA-Novosti. Kosachev reiterated the view of other lawmakers that the attack’s intent was to interfere with international investigators who want to probe whether a chemical weapons attack took place in the town of Douma last week. Iranian state TV is reporting the country’s Foreign Ministry has strongly condemned the U.S.-led airstrikes on Syria. The Saturday report said the ministry warned of regional and trans-regional effects and consequences over the attack,. It said the attack was a flagrant violation of international rules and regulations and ignores Syria’s sovereignty and territorial integrity. Iran is a key ally of Syrian President Bashar Assad and has sent troops to bolster his forces. Iran insists its soldiers are only in Syria in an advisory role, but hundreds have been killed since the civil war began in 2011. Russia says Syria shot down a significant number of the missiles launched in a Western airstrike, using Soviet-designed air-defense systems. The Defense Ministry said Saturday that more than 100 cruise and air-to-ground missiles were launched. It did not say how many of the missiles were intercepted by Syrian forces. France’s defense minister says its joint military operation with the U.S. and Britain against Syria targeted three sites and that Russia was informed ahead of time. Defense Minister Florence Parly told reporters Saturday that the French military sent fighter jets from multiple bases in France and used missile-equipped frigates in the Mediterranean in the operation. Rafale fighter jets could be seen on a video posted overnight by the French presidential palace on Twitter. She added that “with our allies, we ensured that the Russians were warned ahead of time.” Syria’s ally Russia has denounced the western military action. French Foreign Minister Jean-Yves Le Drian said the operation did not target Syria’s allies or civilians but President Bashar Assad’s government because of its alleged use of chemical weapons. Syria’s government denies using them. Hundreds of Syrians are demonstrating in a landmark square of the Syrian capital, waving victory signs and honking their car horns in a show of defiance. The demonstrations broke out early Saturday following a wave of U.S., British and French military strikes to punish President Bashar Assad for suspected chemical attack against civilians. The Syrian government has denied the accusations. In Damascus, the president’s seat of power, hundreds of residents gathered in Omayyad Square, many waving Syrian, Russian and Iranian flags. Some clapped their hands and danced, others drove in convoys, honking their horns. “We are your men, Bashar,” they shouted. State TV broadcast live from the square where a large crowd of civilians mixed with men in uniforms, including an actor, lawmakers and other figures. “Good morning steadfastness,” one broadcaster said. The British Defense Ministry says four of its Tornado GR4 warplanes fired missiles at a military facility as part of the tripartite attack on Syria. The ministry says the missiles were fired around 15 miles (24 kilometers) west of Homs, where it was assessed the Syrian regime keeps agents used to make chemical weapons. The ministry said in a statement Saturday that the warplanes struck the former missile base with Storm Shadow missiles after “very careful analysis” to maximize the destruction of stockpiled chemicals and to minimize any risk of contamination to the surrounding area. It said the facility is located “some distance from any known concentration” of civilian residential areas. The ministry said a detailed analysis of how effective the strike was is continuing, but initial indications show a successful attack. Russia’s Defense Ministry says none of the missiles launched in a Western attack on Syria entered the zones guarded by Russia’s missile defense. Russia has two military facilities in Syria -- an air base at Hemeimeem and a naval base at Tartus. “Not one of the cruise missiles launched by the United States and its partners entered the zone of responsibility for Russian air-defense divisions,” a ministry statement said Saturday. Syrian state-run TV says three civilians have been wounded in the U.S.-led missile attack on a military base in Homs. It says the attack was aborted by derailing the incoming missile but adds nonetheless that three people were wounded. It says another attack with “a number of missiles” targeting a scientific research center destroyed a building and caused other material damage but no human losses. The network says the building in the research center included an educational center and labs. A senior Syrian opposition leader says the international community will have to bear the responsibility for “any revengeful escalation” from the Syrian government or its allies following joint airstrikes from the U.S., Britain and France. In a statement Saturday on Facebook, Maria Zakharova is also taking Western media reports to task. Sakharova is comparing the situation to the start of the Iraq War in 2003 based on claims Iraq was developing weapons of mass destruction. Syrian TV is reporting that the attack on Syria targeted a scientific research center in Barzeh, near Damascus. The report says Syria’s air defenses confronted the missiles near Homs, and says the airstrikes also targeted an army depot there. U.S. President Donald Trump announced the airstrikes in retaliation for Syrian President Bashar Assad’s alleged use of chemical weapons. The British defense ministry says “initial indications” show that the airstrikes against Syria produced a “successful attack” on a Syrian military facility. British Prime Minister Theresa May is describing the attack as neither “about intervening in a civil war” nor “about regime change,” but a limited and targeted strike that “does not further escalate tensions in the region” and does everything possible to prevent civilian casualties. Mattis says the Pentagon will provide more information on the attack Saturday. Mattis spoke Friday night after President Donald Trump announced that the U.S., France and Britain launched military strikes on Syria to punish President Bashar Assad for his alleged use of chemical weapons against civilians and to deter him from doing it again. Mattis is asking that “responsible nations” join in condemning the Assad regime. Defense Secretary James Mattis says the U.S. and its allies have taken “decisive action” against Syrian chemical weapons infrastructure. Mattis briefed reporters at the Pentagon Friday an hour after President Donald Trump announced the strike. Mattis says the United States, along with France and the United Kingdom, struck because Syrian President Bashar Assad “did not get the message” when the U.S. launched airstrikes after a chemical attack in 2017. Explosions are being heard to the east, west and south of Damascus as the U.S., U.K. and France conduct airstrikes in retaliation for an alleged chemical attack by the Syrian government on its own people. Witnesses saw blasts surrounding much of the Syrian capital and a huge fire could be seen from a distance to the east. An AP reporter in Damascus says the attacks turned the sky orange. Syrian television reported that a scientific research center had been hit. Syrian media reported that Syrian defenses hit 13 rockets south of Damascus. After the attack ceased and the early morning skies went dark once more, vehicles with loudspeakers roamed the streets of Damascus blaring nationalist songs.